Emvio is the bracelet that monitors both your daily activity and stress levels. Use it to manage your emotions, in real time. Emvio uses a heart rate variability index to calculate your stress level from minute-to-minute. LED indication of stress level!! The unique technology allows you to specify the start of stress growth. You will be able to determine, that was the cause of stress. 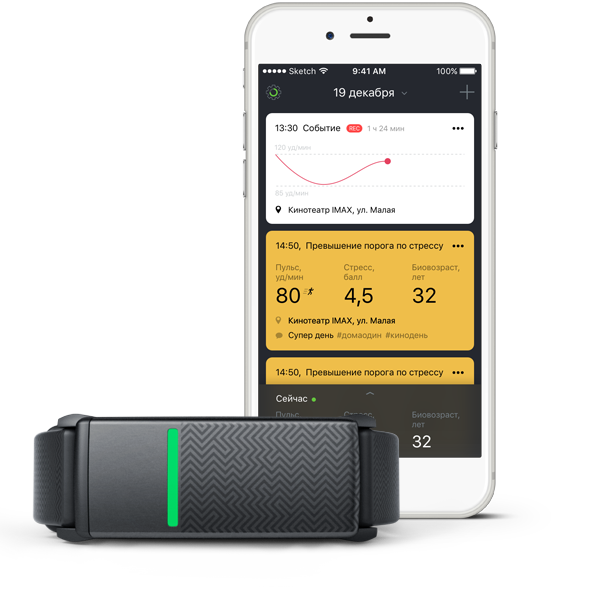 Precise sensors and accelerometer measure your pulse, number of steps taken, distance traveled, and calories burned. Ordinary micro USB slot to charge. No adapters and cradles needed. The biological age graph show you, how your lifestyle and events affect your health. If you do have a smartphone, Emvio's app makes it easy to manage your stress over the long run. When you first consult the app, it displays your current stress level. If it's within the yellow or red range, it gives you a recommendation on stress management. With the Emvio smartphone app, it's easy to make note of your daily encounters with irritating or soothing situations. Whenever Emvio vibrates to alert you to rising or falling stress, your phone will get a push notification asking you to record details about the event - what caused the stress or what you did to decrease your stress. As you add more and more experiences, you'll be able to compare them and see trends over time. You can use this information to analyze your stress triggers. As our Kickstarter campaign progresses, we are receiving a lot of great feedback and questions from our backers. Today is a special day for the Emvio team, and not only because it’s St. Patrick’s Day (here’s hoping for good luck)!